Bancroft Library, Univ. of California, Berkeley. "Eve's Lullaby to Cain." Photo contained in a letter of June 3, 1884, from Hattie Gerhardt to Samuel and Olivia Clemens. Both photos of Echo are courtesy of the Mark Twain Papers, Bancroft Library, Univ. of California, Berkeley. Statue known as Echo. Top photo at left was contained in a letter of June 3, 1884, from Hattie Gerhardt to Samuel and Olivia Clemens. On June 6, 1885, (one year later) Gerhardt asked permission from Clemens to reclaim Echo, make a duplicate for Clemens and exhibit the original in Tiffany's gallery. 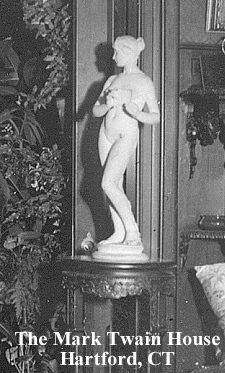 The statue was once in Clemens' home as shown in the photo below which is courtesy of The Mark Twain House, Hartford, CT.
Current location of Echo (or a duplicate) is unknown. A New Orleans Times Democrat newspaper story dated March 19, 1909, gave the location of the sculpture as being in the Paris Salon. Anyone with information as to her location, please contact me. Mentioned in a letter from Karl Gerhardt to Samuel Clemens dated May 29, 1884. Bust of Clemens created during the summer of 1884 after Gerhardt's return from Paris. The sculpture was displayed in Clemens's Hartford home. A photo of the sculpture was used as a frontispiece for the first edition of Adventures of Huckleberry Finn. 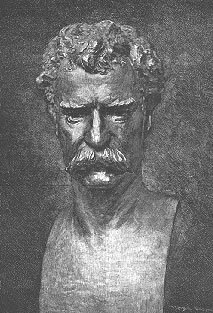 An artist's illustration of the bust appeared in Harper's Weekly April 7, 1887 to accompany an article about Samuel Clemens.